Exeter's main apron on a winter's afternoon, busy with a JEA Short 360 together with B.737s of BMA and Danair. Seen in the background, Scilly Skybus Islander, J&J Bandierante and Merrix-Air's Cessna 421. 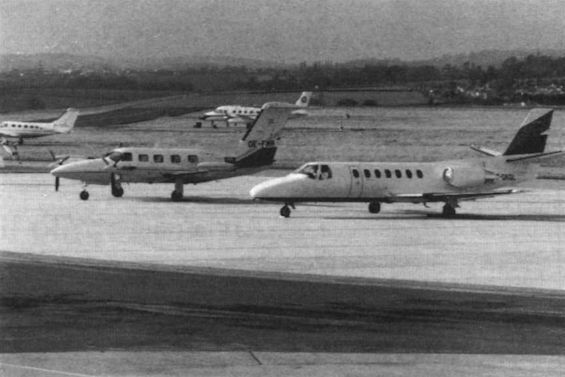 Most days see at least one European visitor, on this occasion both an Austrian Cheyenne III and a French-registered Citation graced the tarmac. Pending preparation by JEA Engineering for lease, a large selection of Short's commuter airliners are dispersed at Exeter's north side maintenance area. 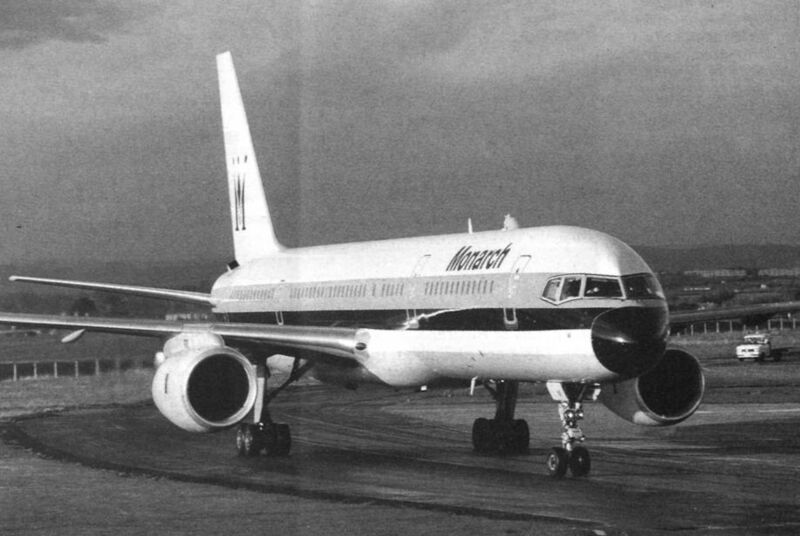 Monarch's Boeing 757 G-MONE negotiates the taxiway at Exeter after its first flight from Florida. Pictured at Sumburgh, Shetland, by Kim Bensonare, left to right: S33LL, Super Tiger G-TIGH based at Sumburgh for Shell offshore flights; two Sk61s BIH, G-BCEA and G-ATBJ and a Beech 200 LN-MOA oil flight on its way to Alasund, Norway. Europe's only Howard 500, N500LN pictured here outside the hangar where proud owner, Duncan Baker spent eight years restoring her. Regular biz-jet visitor is Gulfstream IIB N411WW used by chewing gum magnate, William Wrigley on a visit to his Plymouth factory. Piper Cheyenne III D-IEEF arrived unexpectedly on an air ambulance mission, returning an injured holidaymaker from abroad.